From “The New Mexico Slow Cooker Queen” article in the November 2017 issue. Precooked sweet potatoes can go into a slow cooker with gobs of sugar and marshmallows, but I have never been a fan. I far prefer them with just a little sweetening so it’s possible to really enjoy their natural flavor. Generously butter the inside of the slow cooker. Leave excess butter in the bottom. 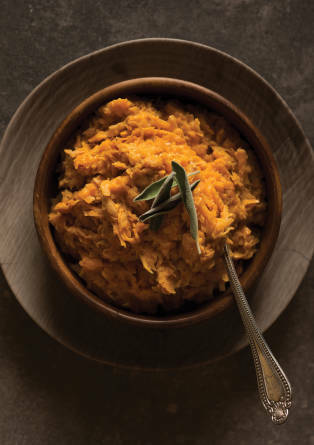 In a mixing bowl, combine the sweet potatoes, apple, 2 teaspoons of sugar, salt, sage, and several grinds of pepper. Pat mixture into the slow cooker. Pour cream over it. Sprinkle the remaining teaspoon of sugar over the top. Cover and cook 4–5 hours on low, until sweet potatoes are very tender. Spoon out portions and serve. Garnish, if you wish, with sage leaves.